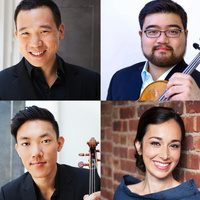 Friends of Chamber Music present Parker Quartet featuring Daniel Chong and Ying Xue, violins; Jessica Bodner, viola; and Kee-Hyun Kim, cello. With beautiful tone color and thoughtful accuracy to their performance, these artists will fulfill your expectation for a remarkable concert. Performing together since 2002, the Parker Quartet trained at the New England Conservatory of Music and is one of the best chamber music quartets today. On September 16, Parker Quartet will host a free master class in chamber music rehearsal techniques at the Conservatory's Recital Hall from 5:30 to 7:30 pm. The master class is open to the public. Tickets to the concert are available at the door or at www.chambermusicfriends.org.